Disbanding the NCFS will lead to worse outcomes. His decision to disband the National Commission on Forensic Science has implications for criminal cases across the country. 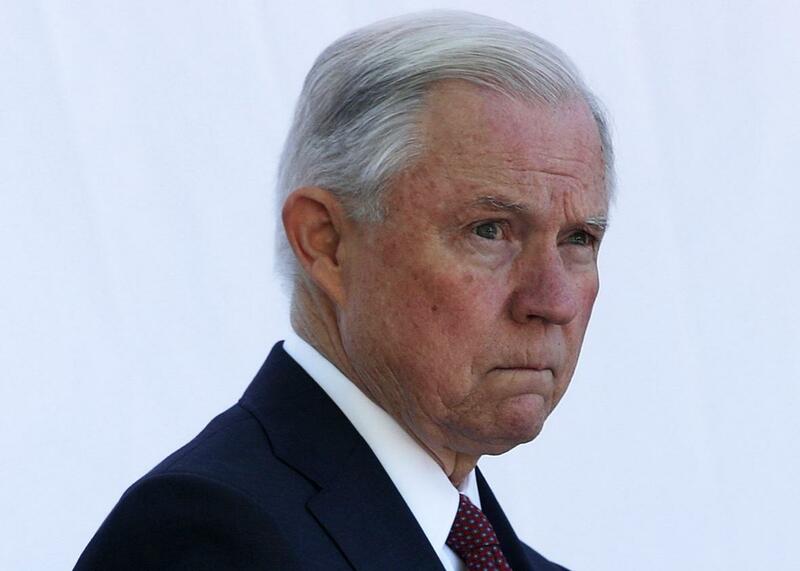 Attorney General Jeff Sessions at the National Law Enforcement Officers Memorial on May 9 in Washington, D.C.
There’s a stack of file folders on District Attorney John Hummel’s desk that won’t stop staring at him. The folders contain the cases of defendants whose convictions were called into question when a state crime lab technician in Bend, Oregon, part of Hummel’s district, was caught tampering with evidence in 2015. The breach may have impacted more than 1,100 cases. Hummel’s office has been steadily reviewing them ever since—of the 500 cases that have been reviewed so far, 30 convictions have been vacated and those cases dismissed. For Hummel, this laborious work has made Attorney General Jeff Sessions’ April announcement that he would no longer support the National Commission on Forensic Science, or NCFS, feel personal. An independent commission established by Barack Obama in 2013, the NCFS was meant to bring together scientists, judges, crime lab experts, prosecutors, and defense attorneys to analyze and improve the field of forensic science, which encompasses the many ways science is deployed in criminal justice. The group was established partially in response to a scathing report from the National Academy of Sciences that highlighted the lack of standards for crime labs nationwide and was attempting to review and improve this and other forensic science shortcomings. Those anticipated guidelines couldn’t prevent the actions of one rogue crime lab analyst, but they could have provided a roadmap for how to mitigate the damage inflicted. As of now, there is no standard procedure for DAs who find themselves in Hummel’s shoes. In the absence of such rules, Hummel has developed what he calls a “decision tree” process for reviewing each case, which his office is using to steadily sift through the hundreds of convictions that have been called into question. Standards being developed by the NCFS would have attempted to prevent future crime lab scandals by helping state and local law enforcement adopt uniform rules to increase accuracy and reliability in their forensic analyses. Sessions’ decision to cut off funding for the NCFS ensures that local district attorneys will continue to fumble around in the dark when it comes to crises like the one in Deschutes County, Oregon—which isn’t an isolated incident. Similar breaches have popped up in crime labs in Massachusetts, Florida, and, earlier this year, Texas—all of which have the potential to invalidate thousands of cases. But Session’s NCFS shutdown all but ensures that these labs across the country will continue to operate using ad hoc procedures, questionable accreditation, and outdated methods. The downsides of gutting the commission will extend beyond crime lab scandals to courtrooms nationwide. The vast majority of judges, prosecutors, and defense attorneys lack formal scientific training, so the NCFS was attempting to bring science-based transparency and accountability to the field. The NCFS’s final report, released after Sessions announced the termination, documented a litany of unanswered questions the organization was working to answer. For example, it was investigating whether crime victims could or should privately pay for untested evidence when unsatisfied by the criminal justice system’s pursuit of a case. It was also trying to improve training for legal workers who use forensic science, increase communication between forensic analysts and actors in the justice system, and update guidelines on how to best store and retain evidence. There are countless examples of what happens when bad science makes its way into the criminal justice system: One review of 300 exonerations, conducted by the Innocence Project, found that the improper use of forensic science contributed to roughly 46 percent of wrongful convictions. While TV shows often make it sound like science-based evidence helps make cases clear-cut, the reality is anything but. Take, for example, the field of bite mark analysis. Most bite mark analysts can’t even consistently agree whether a bite mark is from a human or animal mouth, meaning that this sort of “expertise” should not be offered up in a court room. Still, it often is, and to date, bite mark analysis has been linked to the wrongful arrest or conviction of 25 people, according to the Innocence Project. Bill Richards, who was exonerated last year in California, spent 23 years in prison after being wrongfully convicted for the murder of his wife. The testimony of a forensic dentist regarding a bite mark on his wife’s hand served as a lynchpin in Richards’ faulty conviction. It’s bigger than bite marks, too: In 2015, Anthony Ray Hinton was released from death row in Alabama, where he spent 30 years after a conviction that hinged on what turned out to be faulty ballistics evidence. The same year, also in Alabama, Beniah Alton Dandridge was released after 20 years in prison, where he was serving time for a murder he didn’t commit based on bad fingerprint evidence analysis. And these are just the faulty convictions that ultimately come to light. Bringing scientists to the table helps the Department of Justice more accurately assess whether methods used in court cases, such as testimony from forensic dentists, or ballistics experts, are reliable sources of information. All too often, they have found that it is not: Empirical investigations in recent years have undermined or questioned the validity of many forensic methods, including DNA hair analysis, arson science, and firearm and ballistic identification. Still, cases like Richards’ haven’t deterred many local prosecutors from using “science” in their cases. And unlike Hummel, most local prosecutors supported Sessions’ decision to downsize the NCFS. The National District Attorneys Association, the largest organization of criminal prosecutors in the world, issued a statement applauding the decision. The group argued that the commission “failed to produce work products of significance” and “was dominated by the defense community.” In fact, the commission was led by established professors of chemistry, biology, physics, and forensic science. When announcing his decision not to renew the commission, Sessions said he would appoint a senior forensic adviser and opened a public comment period for feedback. He did not explain how he would replace all of the improvements and recommendations the NCFS was meant to deliver, and he has yet to actually name the new adviser. In the absence of a consistent federal investment in bettering a field that is riddled with bad science, local prosecutors like Hummel—and the defendants they lock up—are on their own.